Sweater weather is here, and I will not be caught out in the fall chill sweaterless. My favorite style has been the flowy, open cardigans that are a little bohemian. They're practically wearable blankets. That said, what I really love about this one from Wet Seal + is that it's more tailored and polished. 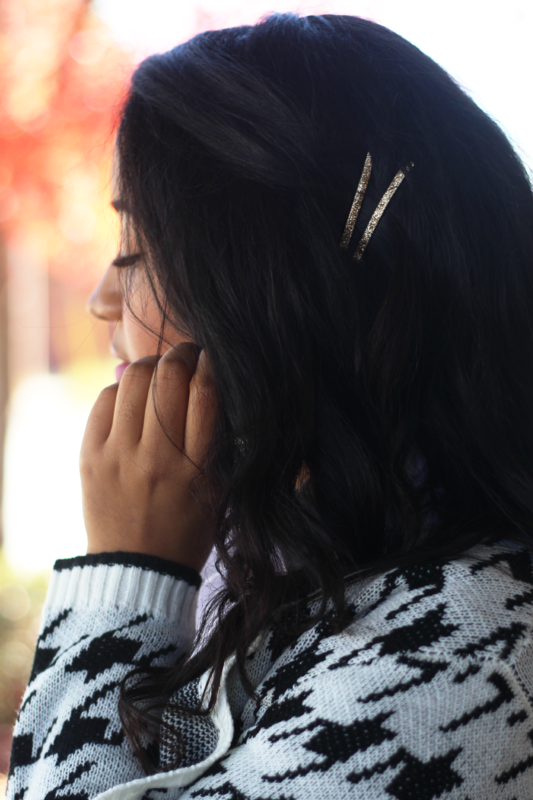 Perfect for a dressier fall occasion (a little holiday called Thanksgiving, anyone?) or, in my case, playing in a pile of leaves. I mean, what could be more like fall than throwing on a cozy sweater and playing in a pile of leaves? Not much I tell ya, not much. The " HOUNDSTOOTH OPEN CARDI" was c/o of Wet Seal. All opinions are my own and were not influenced by the brand. Love this look, it is classy and shool-girl like. The last pic is so cute. Wearable blankets, I love that! I have a black and white one like this and am taking style notes! I can't get enough of cozy cardigans and I love how you paired this one with such a classy outfit. And that Kate Spade bag is perfect! Beautiful classic look! That cardigan is so pretty. I am always afraid to play in the leaves because of all the neighborhood dogs. Might get a little surprise in there if you know what I mean. LOL! love that cardi & your bag! The picture of you throwing the leaves up is adorable. wearable blankets, amen! I love the color of that skirt! Hahaha wearable blankets I love it!! And this piece really is so beautiful and classic!! Dying over this from head to toe!! That houndstooth cardi is fab and I love that last picture! So cute! I honestly love anything houndstooth... I may be obsessed! LOVE this houndstooth sweater! You look so pretty! obsessed with the picture you throwing the leaves! its darling!!! love the forest green and black and white combo! super cute outfit! Oh you are just too cute! I love love love this cardigan and agree it's going to be perfect for Thanksgiving! Seriously loving this outfit. I can see that cardigan worn with so many different bottoms or even over a dress. Great buy! And love the pic with the leaves! You look so fall fab! I love this cardigan! The print is bold, but the colors are tranquil! Perfect combo!! Love your cardigan! You look so cute! Love, love! You look so fab! This cardigan is pretty much perfect. That last photo is so adorable! 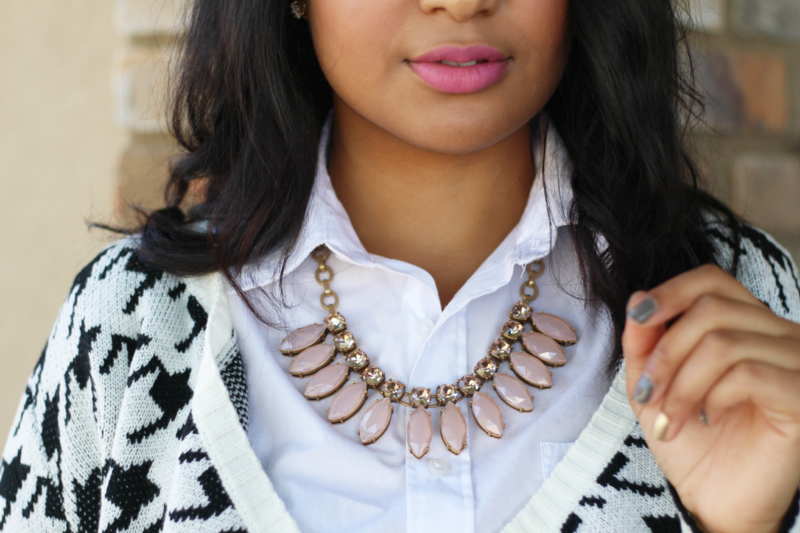 And I love how you styled the houndstooth cardigan with the black and little pink necklace. P.S. I'm giving away a gift card to The Loft on my blog! you even look like one of my classmates. I am obsessed with that white cardi. So gorgeous, Aubrey! Love the classic black and white combo. 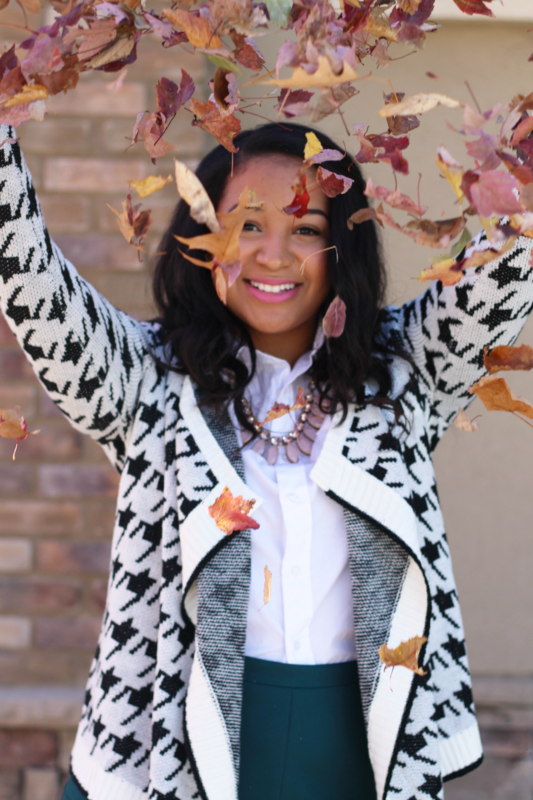 Cardigans are seriously one the best things about fall! You look beautiful, per usual! I love the cardi over your skirt and button down, so easy going! So gorgeous! I could totally wear this to the office! Such a perfect look for fall and love it!!! Hi dear! You look absolutely perfect. Love the cardigan and of course love the bag! Oh my goodness! You look stunning! What a fresh yet classic outfit. So elegant! Super cute outfit :) I luv the skirt!